Is it too late now to say he&apos;s sorry? 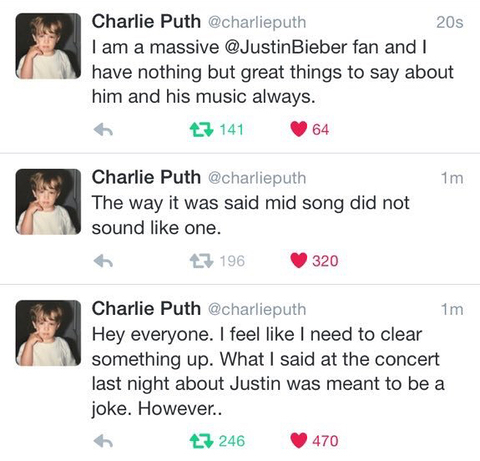 Charlie Puth made a disparaging comment toward Justin Bieber in Dallas on Friday, March 11, while performing his song “We Don’t Talk Anymore.” The 24-year-old singer later apologized for his remarks, but deleted the apology shortly afterward. “F‑‑k you, Justin Bieber!” Puth, 24, shouted in the middle of the performance on Friday, followed by overwhelming cheers from the audience (see the NSFW moment below). “We Don’t Talk Anymore,” a track from Puth’s debut album, Nine Track Mind, features Bieber’s ex Selena Gomez. She was not present at the performance. The “See You Again” singer later took to Twitter to apologize, but removed the series of posts from his account moments later. Bieber, 22, and Gomez, 23, were in a tumultuous on-again, off-again three-year relationship until 2014. The duo have since spoken out about one another on multiple occasions.